Darren filled the three diesel tanks on Waiouru for the first time today and did the bank account scream in pain! This was the moment we discovered to capacity of each tank. 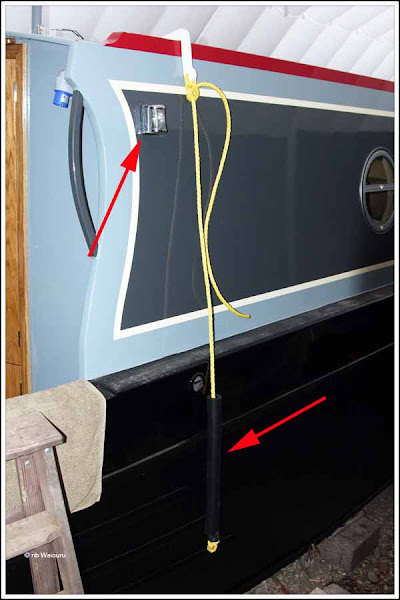 First the bow tank for the Refleks diesel stove was filled. It took 185 litres and the capacity gave us quite a shock as we had guessed it would be approximately 60 litres. Then the “cheek” tank at the stern for the Hurricane central heater was filled. This time the tank was smaller at 91 litres. Finally the engine tank was filled and took 290 litres. Hopefully we will never again have to simultaneously fill three empty tanks! He then went on to complete some painting. 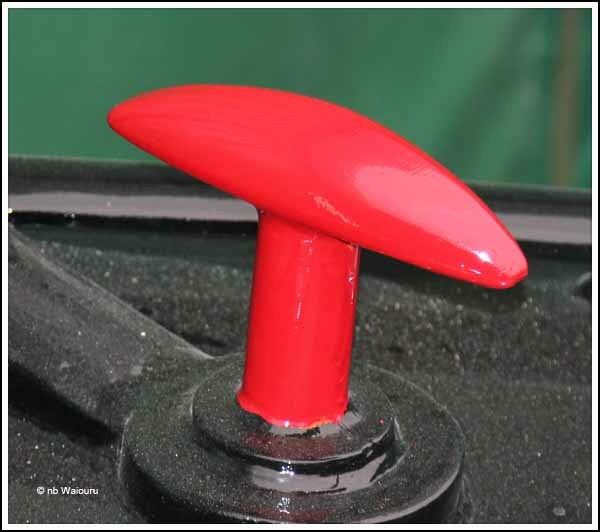 All the anchor points received their first red topcoat and then he masked up the black decking at the stern for non slip paint. 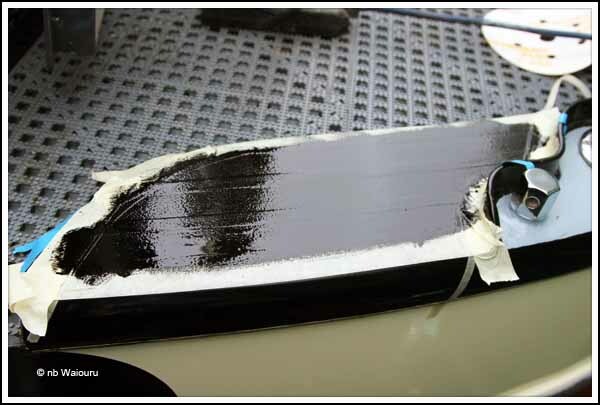 The area has been masked with tape to make three narrow strips of non slip paint. Darren went on to do more ‘touch-up’ painting and then fitted the two front navigation lights. Unfortunately the Red and Green lights weren’t in stock so he has temporarily fitted white lights. It’s only a matter of replacing the glass when the Red & Green fitting arrive. The six side fenders I’d purchased for £33 arrived today. The yellow cordage looks out of place; but then we’re not complaining at the price. Actually the fenders look rather well constructed and the rope can be replaced at a later date. Meanwhile Richard started to fit the oak liner to the inside of the side hatch doors. They are glued on and with five clamps required for each door he only had enough clamps to do one side of Waiouru. The other side will be done tomorrow. 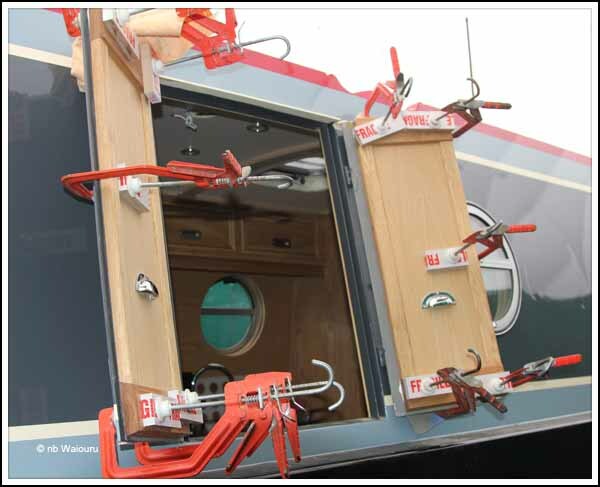 Once the liners were clamped in place Richard decided to make a start on the porthole liners. The first task was to measure the distance (thickness) between the wall lining and the porthole. This had to be done for each liner as the measurements varied. Then Richard made a jig for the bench saw so the liners could be cut to the correct depth. 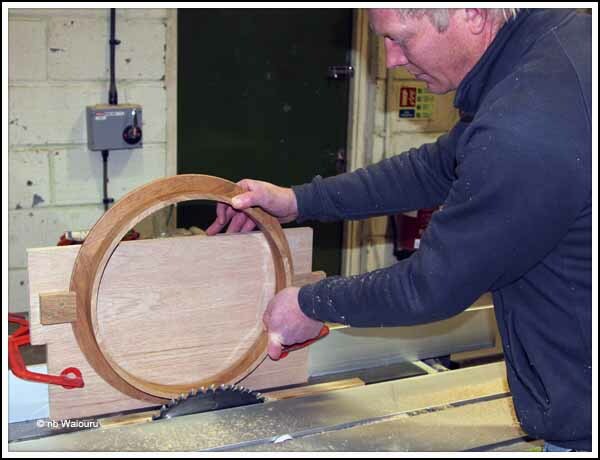 Each porthole liner was rotated through the saw blade thereby ensuring it had a uniform depth. The liner was then checked against the porthole opening and any final trimming was done with a small hand plane. Richard is now cutting a small rebate into the edge of each porthole liner so the window latch will fit. The blacking wasn’t delivered today which has delayed the plan to apply the last coat of two pack. Hopefully it will arrive tomorrow. Nick is also back tomorrow and will probably continue fitting the central heating system.